FSU Art MFA ’18 Lucia Riffel has been featured in the Autumn 2017 issue of Venison Magazine. Venison Magazine is a quarterly online publication founded in 2014 by the Bay Area artist, Amber Imrie-Situnayake. Tallahassee based digital artist, Lucia Riffel, explores digital space and the things that simultaneously exist infinitely and not at all. 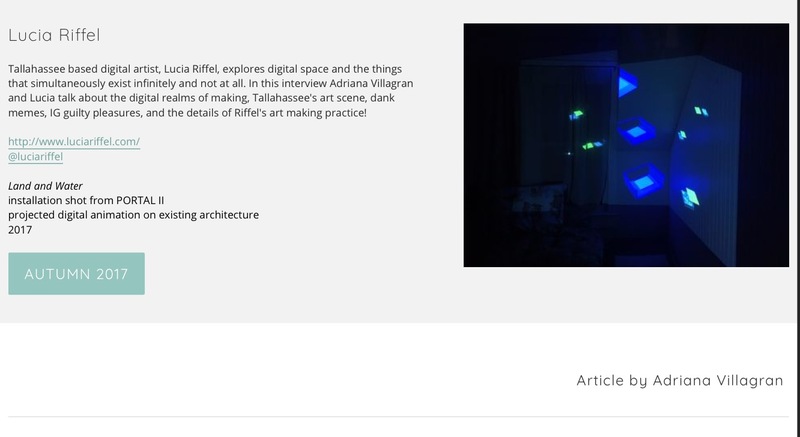 In this interview Adriana Villagran and Lucia talk about the digital realms of making, Tallahassee’s art scene, “dank memes,” guilty pleasures Instagram, and the details of Riffel’s art making practice!